Traditionally, Muslims adhere to several articles of faith. Some of the most widely known include: There is only one God; God has sent numerous Prophets, with Muhammad being the last; God has revealed Holy Scriptures, including the Quran; God’s angels exist, even if people cannot see them; and there will be a Day of Judgment, when God will determine whether individuals are consigned to heaven or hell.15 In addition, another core tenet is that God’s will and knowledge are absolute, meaning that people are subject to predestination, or fate, though they also have free will. Belief in these articles of faith is generally widespread among Muslims. As discussed in Chapter 2, affirmation that there is one God and Muhammad is His Prophet is nearly unanimous in most of the 39 countries included in the study. Only Muslims in sub-Saharan Africa were asked whether they view the Quran as the word of God or a book written by men; across most of the African nations polled, nine-in-ten or more Muslims say that the Quran is the word of God, including more than seven-in-ten who believe it should be taken literally, word for word. Other articles of faith – belief in angels, predestination, heaven and hell – also are broadly embraced. In the countries surveyed in Southeast Asia, South Asia, and the Middle East and North Africa, clear majorities of Muslims endorse these tenets. In Central Asia and across Southern and Eastern Europe (Russia and the Balkans), however, there is more variability; in these two regions, for example, the percentage of Muslims who believe in predestination or fate ranges from fewer than half in Albania to over nine-in-ten in Azerbaijan and Turkey. Hadith – or “sayings” – are accounts of the words or practices of the Prophet Muhammad. They are a key source of authority in Islam, surpassed only by the Quran. This report cites a variety of hadith, in part to explain why particular questions are included in the survey. Readers should note that the meaning, reliability and application of specific hadith may be subject to interpretation. For example, Sunni and Shia Muslims do not necessarily accept the same sets of hadith as reliable. For additional information regarding hadith, see Wilfred Madelung and Farhad Daftary, editors. 2008. “The Encyclopaedia Islamica.” London: Brill. The Quran makes multiple mentions of angels, both collectively and individually, as in the case of the angel Gabriel.18 In light of this, it is perhaps not surprising that in most countries surveyed, a majority of Muslims say they believe in angels; in some regions this belief is nearly universal. Across Southeast Asia, South Asia, and the Middle East and North Africa, nine-in-ten or more Muslims affirm the existence of angels. In the Central Asian countries of Turkey (96%), Tajikistan (89%) and Azerbaijan (88%), overwhelming numbers also say they believe in angels. However, acceptance of angels is slightly less prevalent elsewhere in Central Asia, including in Kyrgyzstan (77%), Uzbekistan (74%) and Kazakhstan (66%). Muslims in sub-Saharan Africa also vary in their attitudes toward angels, though more than half in all countries surveyed affirm this belief. In seven of the 16 countries in the region, eight-in-ten or more say angels exist, including as many as 97% in Tanzania. 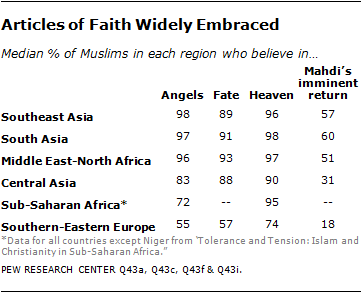 In the remaining nine countries surveyed in the region, belief in angels ranges from 72% in Mali to 52% in Djibouti. Among those surveyed, Muslims in Southern and Eastern Europe are generally the least likely to believe in angels. Fewer than two-thirds of Muslims embrace this article of faith in Russia (63%), Kosovo (60%) and Bosnia-Herzegovina (50%), while Albania is the only country in the study where fewer than half of Muslims (42%) believe in angels. In general, Muslims who are highly committed to their faith, as measured by frequency of prayer, are more likely to believe in angels. The gap on this question between those who are highly committed (they pray several times a day) and those who pray once a day or less is particularly large in Southern and Eastern Europe and in Central Asia. In Kosovo, for example, highly committed Muslims are 32 percentage points more likely to believe in angels; in Russia, the gap is 28 points. Among the Central Asian countries surveyed, the gap is 20 percentage points in Uzbekistan and 15 points each in Azerbaijan and Kyrgyzstan. Predestination, or fate, is another traditional article of faith that is widely embraced by Muslims around the globe. In 19 of the 23 countries where the question was asked, at least seven-in-ten Muslims say they believe in fate. In the Middle East and North Africa, roughly nine-in-ten or more Muslims in Tunisia (98%), the Palestinian territories (94%), Egypt (93%), Iraq (93%), Jordan (91%), Morocco (91%) and Lebanon (89%) endorse the idea of fate. Belief in fate is also widespread across Southeast Asia and South Asia, with the number of Muslims who affirm this article of faith ranging from 95% in Indonesia and Afghanistan to 74% in Bangladesh. Acceptance of fate is nearly as high in Central Asia. With the exception of Muslims in Kazakhstan (59%), at least seven-in-ten in every country in the region embrace the concept of predestination, including as many as 93% in Azerbaijan and 92% in Turkey. Overall, Muslims in Southern and Eastern Europe are less likely to embrace the notion of fate. Levels of belief range from 78% in Bosnia-Herzegovina to 44% in Albania. Belief in fate varies by level of religious commitment. In seven of the 23 countries where the question was asked, those who are more religiously committed are more likely to believe in fate. The prime example is Kosovo, where 59% of those who pray several times a day believe in predestination, compared with 36% of those who pray less often. The Quran states that God will judge each individual by his or her deeds and that heaven awaits those who have lived righteously and hell those who have not.19 Belief in the afterlife is widespread among Muslims – majorities in all but one of the countries surveyed say they believe in heaven and in hell. In South Asia and Southeast Asia, belief in heaven is nearly universal. The conviction that paradise awaits the faithful is nearly as prevalent across the Middle East-North Africa region. In these three regions, belief in heaven ranges from 99% in Thailand and Tunisia to 88% in the Palestinian territories. Similar levels of belief are found in sub-Saharan Africa and Central Asia, with nine-in-ten or more Muslims in most countries reporting that heaven awaits those who have lived righteously. In sub-Saharan Africa, the only countries where slightly fewer subscribe to this view are Chad (87%), Guinea Bissau (87%), Tanzania (86%) and the Democratic Republic of the Congo (85%). In Central Asia, Kazakhstan is the outlier, with only 70% of Kazakh Muslims expressing belief in heaven. Overall, the lowest levels of belief in heaven are found in Southern and Eastern Europe, although even in that region at least half of Muslims surveyed in each country subscribe to the idea of paradise in the afterlife. As in the case of heaven, belief in hell is particularly pronounced among Muslims in Southeast Asia, South Asia, and the Middle East and North Africa. Across all three regions, more than eight-in-ten Muslims say they believe in hell, with as many as 99% in Thailand and Tunisia subscribing to this view. Slightly smaller majorities in Central Asia – ranging from 88% in Azerbaijan and Kyrgyzstan to 66% in Kazakhstan – also say that hell awaits those who have not lived righteously. Overall, the concept of hell is less widely embraced in Southern and Eastern Europe, with as few as 46% of Muslims in Albania endorsing the concept – the only country surveyed where less than a majority of Muslims believe in hell. While respondents in some countries are less likely to say they believe in hell than heaven, the difference is especially pronounced in sub-Saharan Africa. In four of the 16 countries surveyed in the region, the percentage that believes in hell is at least 20 points lower than the percentage that says heaven exists: Guinea Bissau (23-point difference), Liberia (23 points), Uganda (23 points) and Mozambique (22 points). In the other sub-Saharan countries surveyed, belief in hell and heaven differs by about 10 points or less. Muslims who are more religiously committed tend to express higher belief in the existence of both heaven and hell. This is especially true in Southern and Eastern Europe. For example, in Russia, among those who pray several times a day, 79% believe in heaven and 78% in hell. By contrast, among Russian Muslims who pray less frequently, 49% believe in heaven and 46% in hell. According to Islamic tradition, the Mahdi will rid the world of injustice and his return – along with the return of Jesus – will precede the Day of Judgment (see Glossary).20 The survey asked Muslims in 23 countries whether they expect the Mahdi to return in their lifetime. A similar question was asked about the return of Jesus. In most countries surveyed in the Middle East and North Africa, South Asia and Southeast Asia, half or more Muslims believe they will live to see the return of the Mahdi. This expectation is most widespread in Afghanistan (83%), Iraq (72%), Tunisia (67%) and Malaysia (62%). It is least common in Bangladesh (29%) and Indonesia (23%). Outside of these three regions, belief that the return of the Mahdi is imminent is much less prevalent. Across Central Asia, no more than about four-in-ten Muslims surveyed in any country think they will live to see the Mahdi return; the exception is Turkey, where about two-thirds (68%) expect to witness his return. In Southern and Eastern Europe, only about a quarter or less share this expectation. Belief that Jesus will return in one’s lifetime generally mirrors belief in the imminent appearance of the Mahdi. In only five of the 22 countries where the question was asked do substantially fewer Muslims believe Jesus’ return is imminent: Azerbaijan (-22 percentage points, compared with belief in the return of the Mahdi), Bangladesh (-15), Indonesia (-15), Jordan (-13) and Russia (-12). In just one country, Uzbekistan, do significantly more Muslims anticipate the return of Jesus than the Mahdi (31% vs. 22%).